zCover Inc, the leading manufacturer of fashionable silicone protective cases, has aannounced today the release of their iSA Duet Fashionable Silicone Protective Case for the new iPod® with video. This iSA Duet case features an unprecedented duo tone color, allowing you to display the color you like while still displaying the trademark style of the silver iPod back. The multi-color iSA Duet is designed perfectly to integrate the ultimate protective quality of the case with an aesthetically form fitting streamline appearance. Each zCover "iSA Duet" retail pack contains one protective case, one hard crystal clear Screen Protector with soft rubber ring pad and a removable rotary Belt Clip. In its first release of the iSA Duet, zCover is offering a selection of four colors to the consumer. "It took us years to develop and perfect the mass production technology of multi-color silicone cases. This iSA Duet case features an unprecedented duo tone color make: the front half and the back half, which are of different hues, gracefully meet with a perfectly pure and clean seam. It attests to our advanced silicone manufacturing technology and our ability to lead the way in fashionable silicone protective cases." 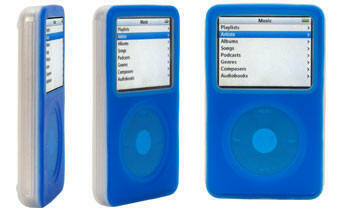 said Sean Sa, vice president of zCover Inc. "iPod users can now dress their iPod a la iPod, individualistic and colorful as their music collections. Available in four colors of iSA Duet will be able to change the look of your iPod to match your mood, your fashion and your style while keeping your treasured device safe." Paired with zCover customized crystal clear hard Screen Protector with soft landing ring pad, zCover iSA Duet will protect 98% of your new iPod's surface and simultaneously allow for complete functionality of its controls, in keeping with and enhancing the dual color designs of iPod products. Combining zCover's advanced molding technology with its industrial know-how; all of zCover iSA series cases for iPod are stunning. They boast a state of the art integrated click wheel protector that allows the user full click wheel access. As common to all of zCover's lines, the iSA series also features a customized crystal clear hard screen protector and removable rotary belt clip. At zCover, we are always striving to make the best possible product. Crystal clear hard screen protectors display your graphics in perfect detail while still maintaining a glove like fit to prevent scratches to your screen. IIn this first release of iSA Duet, zCover will feature silicone cases with a translucent front of one of four colors and an ice clear back. They are exclusively designed to give a splash of extra color and excitement, while providing durable protection. 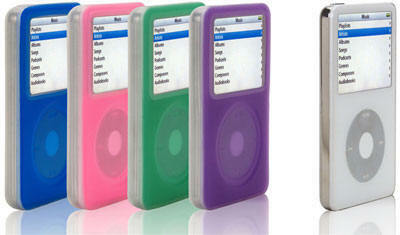 zCover iSA Duet offers you a choice of four fun and bright colors: Blue, Pink, Green and Purple. Each zCover iSA duet (retail packaging or on-line-order packaging) for the new iPod with video contains one iSA Duet silicone case, one hard crystal clear screen protector and one removable rotary Belt Clip.